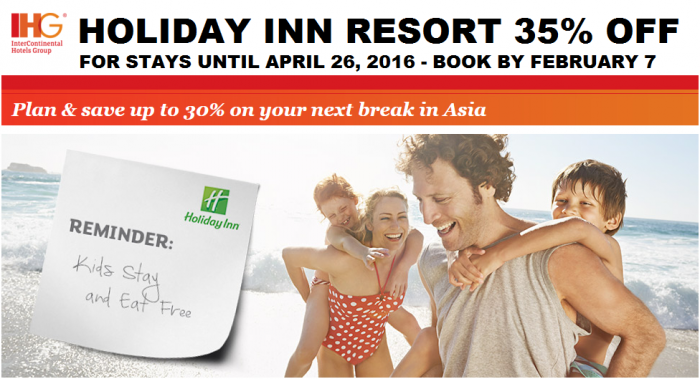 IHG Rewards Club has launched 35% off breakfast inclusive sale for select Holiday Inn Resorts in Asia. Members get 35% off (non-members 30%) for stays until April 26, 2016 that are booked by February 7. 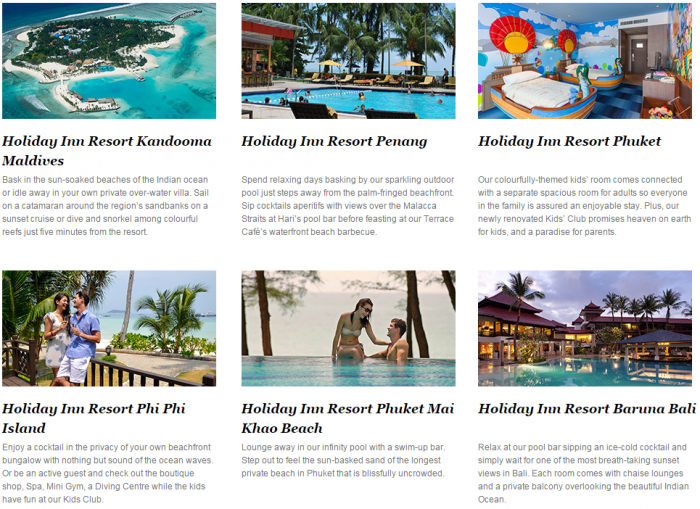 I have stayed at the Holiday Inn Resorts in Baruna Bali and the one in Phi Phi island. Both were solid properties. You should check the rates under this sale if you are planning to visit any of the 10 resorts before the end of April. Rates are per room, per night and are subject to availability. Offer includes up to 30% off room rates, or room with breakfast rates. You must be an IHG® Rewards Club member to be eligible for the additional 5% discount. Breakfast is for 1 or 2 adults sharing a room. In-room breakfast is not available for this rate. Must book at least 3 days in advance. All Advance Purchased reservations are final and require full payment for the entire stay at time of booking. Tax and service charges apply. Final bill will be presented in local currency of the hotel. Full prepayment is required at time of booking, cannot be amended and is non-refundable. Credit card surcharges apply. Blackout dates apply. Rates only applicable to participating hotels in Asia Pacific (excluding China, Hong Kong, Macau and Taiwan), Middle East and Africa. Rates for participating hotels are available for booking until 7 February 2016. A minimum length of stay may apply. Please check with the hotel directly should you require further clarification. Stay must be completed by 26 April 2016. Offer is not valid to groups of 10 or more rooms and cannot be combined with any other special offer, including but not limited to InterContinental Ambassador’s complimentary weekend night certificate. At Holiday Inn, Kids 12 years and under stay for free sharing parent’s guest room in existing bedding and eat free from the all-day dining restaurant with an accompanying paying adult guest. Rates qualify for IHG® Rewards Club Points. Standard IHG® Rewards Club programme terms and conditions apply. Visit ihgrewardsclub.com for details. Other terms and conditions apply.